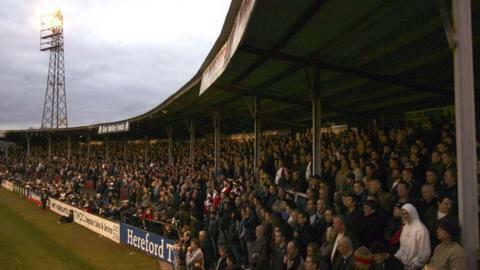 Hereford United's board of directors have agreed to talk to the club's Supporters Trust (HUST) about their proposed takeover of the club. But the board insist that other offers could provide a better deal. "The Board is still in discussions with interested parties," said an official statement from the club. "The board has invited the Trust to talks, but stresses discussions with other potential investors continue. "The directors say these potential investors offer a significantly better outcome for the current board than the Trust's offer. "The statement says the leases for land at both ends of the ground are an asset worth £1m, with the potential for future income of up to £1.5m from the sale of each end in the coming years. "This, the board feels, represents the best current deal for the club." "Though not finalised nor signed, the detail under discussion offers the board potential of a significantly better outcome than the Trust's offer." However, HUST spokesman Martin Watson told BBC Hereford & Worcester: "We're the last offer on the table. We're in a position of crisis and, if someone else is successful, we've no objection to that. All we want is the offer that keeps the club running." "With the pledges we've got so far, we should have enough money to cover the immediate demands of £220,000. "That's basically to get us past the Conference AGM at the end of May. We need roughly £80,000 to settle the latest tax bill and the remainder is wages and footballing debts, of loan payments owed other clubs." "The deal we have put on the table is that, effectively the club is up for sale for a pound as there are a lot of debts out there. Not just the £220,000 but a further £300,000 needed to service other debts. "The rent and rates on the stadium are due and the main phone line has not been paid, so the club are using a single line from out the back office." The board have held meetings with representatives of both main fan bodies, the HUST and the longer-established Hereford United Independent Supporters' Association. But they are also "at an advanced stage" of talks with Herefordshire Council over property development opportunities at both ends of the club's council-owned Edgar Street home. "The leases represent an asset with a value of approx £1 million, with a potential inflow of cash to the football club of an estimated £1 million-£1.5 million over the coming years from the sale of each end, the majority of which will be used to re-shape the terracing," added the club statement.